A holly hedge can provide privacy and mark a boundary like a property line. 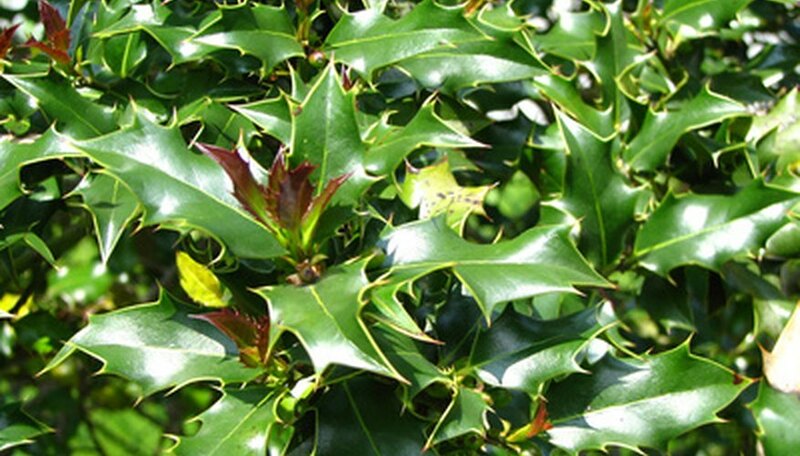 Holly is ideal for hedges because of its relatively rapid growth and dense form. The red berries also add festive spots of color against dark green leaves that are set off by snow covering the landscape. When choosing holly to create a living wall, check the nursery tag to see if the mature height meets your needs. Measure the length of the area where the holly hedge will be planted. Most holly prefer full sun and well-draining soil. Check the nursery tag to see if your holly can thrive in partial shade if full sun is not an option. Take the measurement with you to the nursery. Read the plant label, which will tell you the width of the mature holly. You can then divide the landscape measurement by the mature width of the holly to determine how many holly shrubs you will need. The shrubs will either be in containers (usually plastic) or wrapped in burlap, which is referred to as B&B (ball and burlap). Place the holly shrubs in your landscape, spacing them apart as indicated on the nursery tag. Do not plant them yet. Step back and check the spacing. You may choose to move the row 1 to 2 feet left or right to immediately disguise an unpleasant object, like a TV cable post. Dig the hole twice as wide as the container or B&B. The depth of the hole should be slightly shallower than the root ball of the plant, which would be the distance from the bottom of the container to the top of the dirt in the container or the height of the burlap ball. The objective is to plant the shrub with the top of the root ball 1 to 2 inches above ground level. Jab the point of the shovel around the sides of the hole to loosen the soil for better root penetration. Remove the holly from the container or burlap. Use your fingers to loosen the roots around the root ball. Place the holly into the center of the hole. Check to see that it is upright and that the top of the root ball is slightly above ground level. Backfill the hole halfway with the soil removed from the hole. Water around the root ball to settle the soil. Finish backfilling the hole and water again. Apply 2 to 3 inches of mulch (like wood chips or compost) around the holly, keeping the mulch away from the trunk. You don't need to need to prune your holly shrub unless you want a specific shape or need to control its growth.